Congratulations! You’re the proud owner of PEAK Values® cards. Understanding your own and other people’s core values is a wonderful way to establish priorities, and open productive dialogue. While many values in life are important, making the tough call to determine your top values creates interesting insights. 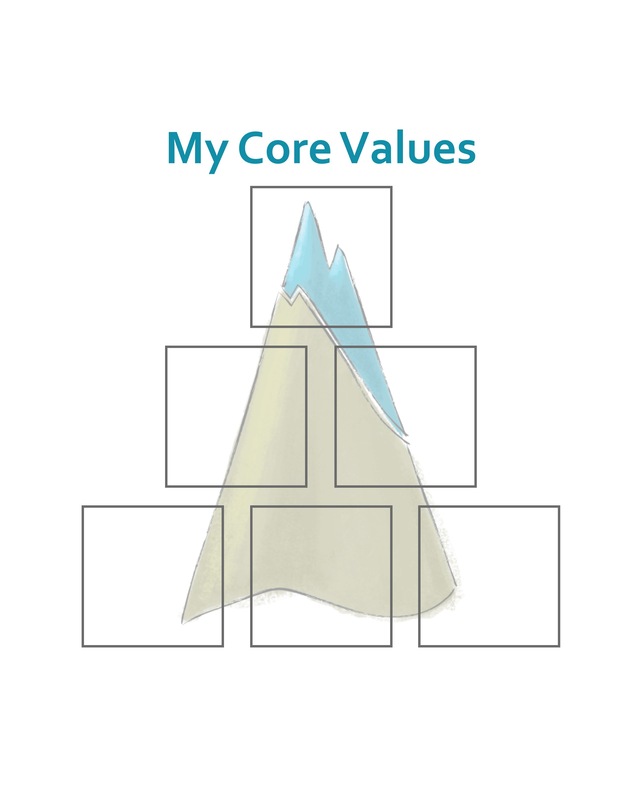 The values you consider core should remain relatively stable, but may change somewhat throughout your life depending on experiences and current life stage. Revisiting your results from time to time can raise additional questions to consider. When we started The PEAK Fleet in 2016, we brainstormed, debated, and narrowed down our values to the top 10. And then, ultimately, established the top 4 of PERSISTENCE, EMPATHY, AUTHENTICITY, and KINDNESS, as we set the vision and mission for what would become The PEAK Fleet. Our values were so vital to us, we named the company after them! After the powerful experience we have had in discovering and constantly referencing our core corporate, or PEAK Values®, we wanted to share the exercise with others in a new, creative, and beautifully designed way. We created the PEAK Values® card deck with that in mind. The card deck can be used in many different ways. The instructions for the basic “Top Values” Identification exercise are included with the deck, and on this page. In addition, we have created several other exercises that may be useful. Please enjoy these recommended exercises with your PEAK Values® card deck(s), and as you invent your own, new ways to use them, we’d love to hear about it! This reflection activity can be done alone, or as step 1 to a group discussion. This deck includes Values Cards and 2 blank cards. Each person completing the evaluation should first quickly narrow the field down to 28 top values, adding 1 or 2 of their own if those top life values are not found in the deck. Next, taking some additional time to really contemplate the nuances of the values, narrow the field again down to 14. Finally, identify your Top 6 values. Start with the Personal reflection activity above. After each person in your party has identified their top values, go around your group, having each person share what values they selected, and offer some reasons why those are important to them. Next, have a discussion about the similarities and differences between each of your Top 6 values. Conduct the values exercise as a group. Deal the deck of cards out (leaving out the 2 blank cards) to each member of the group. Going around the group, have each member take a turn, selecting a card and handing it to the person to their left. The card recipient should read the card aloud, and then say something about what that value means to them. Is it important or unimportant to them? Why? The recipient makes a recommendation of whether that card represents the group’s core values as a whole. If they want to consider it a top value, place the card in the middle of the group. Or, if not, set it aside in a discard pile. Once the group has gone through all 55 values, determine if any values are missing, and use the blank card(s) to represent them. How many values are in the center? Repeat the process until you narrow down the group values to the top 6-10 values. Commemorate the top values by creating a poster that displays them all. After each person in your team has identified their top values, go around your group, having each person share what values they selected, and offer some reasons why those are important to them. Next, have a discussion about the similarities and differences between each of your Top 6 values. This exercise is suitable when a team would benefit from determining common values, to assist in working together on a project with shared goals. After completing a Basic Team Building exercise where individuals identify and discuss their personal top values, identify the values held in common. Also, reflect on the goals for the team and/or project. How would a focus on particular shared values help in achieving those goals? There are many ways to consider which of the 55 values are the team’s top values; one way is to deal out the cards evenly to all team members, have them select a card to read and recommend whether it is a top value. Narrow down the choices to the team’s top 6-10 values. Another option is to lay out the cards, place a piece of paper near them, and place sticker dots or tally marks to vote on your top 6 values. The top 10-12 with the most votes should be discussed and identify the team’s Top 6 values. Use the PEAK Values “Top Values” poster to display the cards chosen as the top values. As a daily reflection exercise, draw a card from the deck each day. Reflect on what that value means to you. Ask: How have examples of this value been a part of your life, and were they positive or negative experiences? Consider writing your thoughts in a journal. How did you use the cards? What kind of insights did you gain?